Hi! 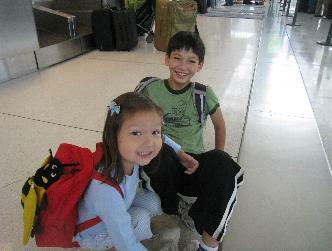 We are Sho Scott (age 10) and Saya Scott (age 4). In the summer of 2011, we plan to circumnavigate Iceland by bicycle with our dad, Charles Scott. We will carry a tent and all of our gear on the bikes, and have mapped out a route of around 1500 miles. It should be a fun challenge! Are You Sure that You Can Make It? No, but we’ll try. Iceland is rugged and often has strong winds, but we will do our best to anticipate and deal with these and other issues. We will make time along the way to play and explore this fascinating country, proceeding at a pace that should be manageable. Also, we will draw on our experience from the summer of 2009, when Sho (then age 8) and his dad rode connected bicycles 2500 miles over 67 days across the length of Japan. We documented the adventure at www.japanbikeride.com. We hope this effort inspires families to come up with their own ideas for shared adventures, and reminds people of the amazing accomplishments children are capable of. We will use any media attention we receive to encourage people to protect and preserve our planet’s natural resources. The United Nations named Sho and his dad "Climate Heroes" (see http://www.unep.org/wed/2009/english/content/climateheroes.asp) for the ride across Japan in 2009, when we raised money for a global tree planting campaign and encouraged action by governments around the world to address climate change. The UN Environment Programme (www.unep.org) is sponsoring this ride too. Click on the Blog tab to see the latest updates.